When setting up a quality work zone, the focus should be on meeting or exceeding state guidelines in order to keep your crew and the traveling public safe. While work zones vary from job to job, one aspect that never changes is the necessity to maintain a clear and adequate buffer space. Not only are these included in each state’s Department of Transportation legislation, but they also increase the safety in work zones for traffic, construction laborers and our traffic control flagmen and guides. That’s why we take buffer zones and traffic control taper length seriously here at Flagger Force. WHAT IS A BUFFER SPACE? A buffer space is an open area behind the cone taper that protects workers by providing motorists a place to slow down and stop if they accidentally drive through the cones (or other devices) and intrude into the work zone. This essential space dramatically reduces the risk of a motorist striking workers or work zone equipment. 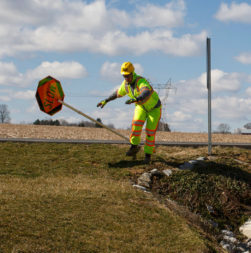 Planning ahead for all potential situations is an important key to work zone safety, and is why our team at Flagger Force always includes adequate buffer space. When setting up a work zone, common errors include not including a buffer space, setting up a buffer space that’s too short or not recognizing the importance of the open space and wrongly utilizing it to park vehicles and equipment. A buffer space shouldn’t be considered “regular” working space. It can be tempting for construction crews to absorb buffer space into their working space. The problem is that this removes the buffer required in case of an emergency such as a runaway vehicle or accident avoidance. At Flagger Force, not only do we plan adequate buffer space, but we also communicate the importance of maintaining this space with construction zone project managers and construction laborers. Our crew members watch for vehicles and equipment parked in buffer zones, and ensure these areas are kept clear and safe. Every work zone should include a buffer space. The length of a buffer space is determined by the speed of the roadway (see chart below). Do not park any vehicles or equipment in the buffer space. If a vehicle is not working in the work zone, park it a safe distance away (e.g. side road, parking lot). We teach the importance of traffic control taper length and buffer space as part of our Flagger Force Academy. 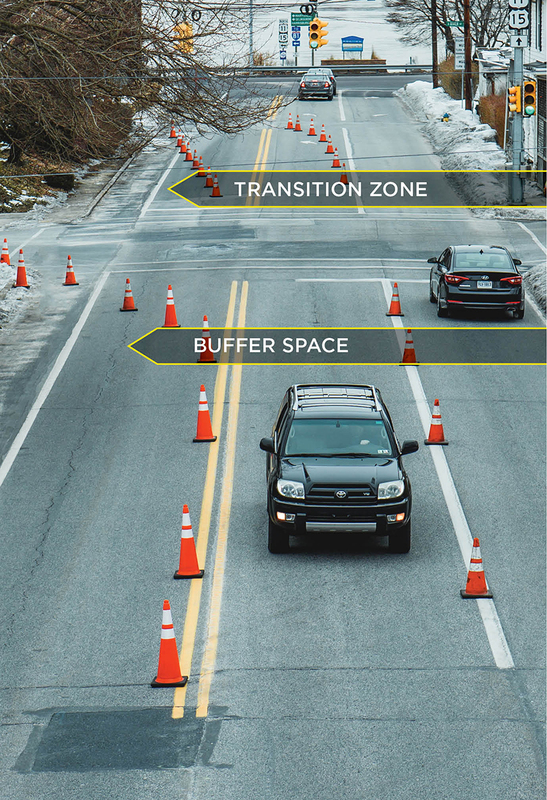 Instead of leaving these aspects of temporary traffic control at work zones to chance, we apply the same systematic approach to every work zone. Together with your project manager, we’ll measure out and mark your buffer zones and help your construction crews understand the importance of respecting these zones. Ideally, buffer zones wouldn’t be required, but our experience shows us that including this extra space for safety results in fewer accidents when drivers aren’t paying attention. Let us help you secure your road construction work zone and apply our best practices for putting in place work zone taper lengths for lane deviations and buffer zones around construction crews and equipment.